You'll love how quickly and easily you can make applesauce in a pressure cooker. It truly takes mere minutes to cook and yields delicious tender-yet-chunky results. Use a combination of tart and sweet apples, or adjust the amounts of brown sugar and lemon juice in this applesauce recipe to achieve the perfect sweet-sour flavor. 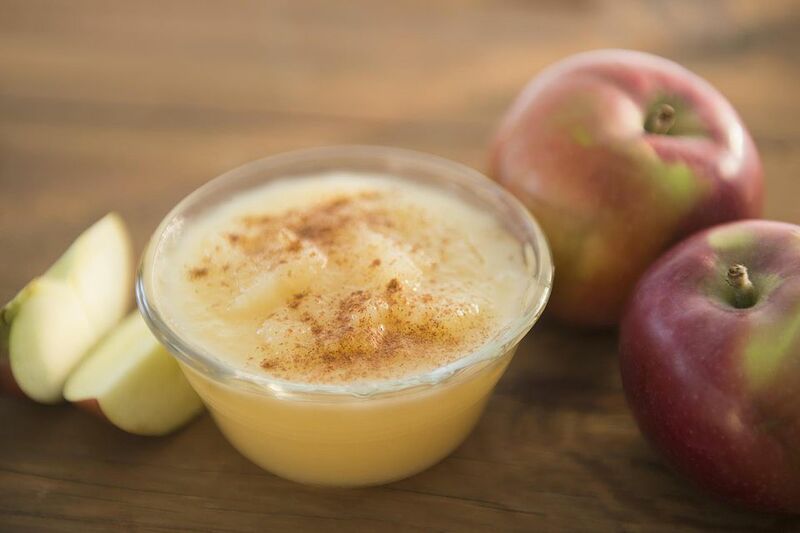 If your applesauce turns out too tart after cooking, add some more sugar. If it's too sweet, try adding a little more lemon juice. The best apples for applesauce and other cooked apple recipes include Mutsu, Fuji, and Rome apples. Peel and core the apples and cut them into equally sized wedges. In a pressure cooker, combine the apples, brown sugar, cinnamon, apple juice or cider, lemon juice and salt. Cover the cooker and lock it into place, then place the cooker on the stove over high heat. Bring the pressure cooker up to high pressure, then immediately start the timer for 4 minutes and reduce the heat to maintain pressure. After 4 minutes, remove the pressure cooker from the heat and release pressure using the natural method (in other words, just let the closed pressure cooker rest until the pressure gauge indicates the steam pressure has been released, about 10 minutes). Carefully open lid, angling it away from you to avoid getting burned by the steam. With a wooden spoon, stir the apples, breaking them up large chunks, until you've achieved the desired consistency. If you like a very smooth applesauce, you can put the mixture in a food processor and pulse it a few times, or put it through a food mill. Serve it warm or at room temperature as a condiment for roast pork. Stir it into baked goods like muffins or spice cake to take place of some of the fat or oil. Spoon servings into ramekins, top with granola, and bake at 350 F until heated through. Top with vanilla or caramel ice cream. Top plain or vanilla yogurt. Add a little to oatmeal. Mix into pancake or waffle batter in place of the oil.